Ventura County Fire Department Captain Anthony Romero thought he would have to rent for the rest of his life; he’d been looking for a home to purchase for years. Romero and his wife Monica had seen prices escalate and were continually outbid when they made offers. As their family grew, they almost gave up hope. 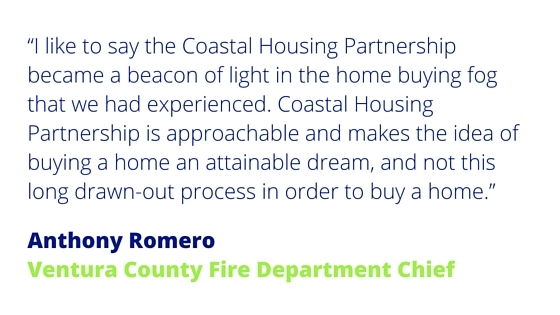 When Romero found out that his employer provided him a housing benefit through nonprofit Coastal Housing Partnership, the picture became brighter. Today, his home purchase is one of the many success stories Coastal Housing Partnership is proud to have been a part of. As a result of Coastal Housing Partnership programs, the Romero family received a $5000 credit toward closing costs from the builder, in addition to receiving a significant credit from the on-site lender toward closing costs. Since its inception, Coastal Housing Partnership has helped thousands of families become home owners. Coastal Housing Partnership’s 5th Annual Home Buying Fair will be on Saturday, May 14, 2016 from 10am to 3pm at the Ventura Beach Marriott and will provide attendees with the tools to get on their path to home ownership. Admission for the 5th Annual Home Buying Fair is free for employees of Coastal Housing Partnership members, $5 for adults, and children under 18 are free. To read more about Anthony Romero and his home buying success story, read the press release by clicking here. To RSVP for the Home Buying Fair, click here. This entry was posted in Success Stories and tagged 2016 home buying fair, Anthony Romero on April 19, 2016 by Coastal Housing Partnership. Katherine Firkins and Ignacio Ponce at their home in Santa Barbara, Ca. The couple tapped the educational resources and the Network Partners of Coastal Housing Partnership to help them buy their first home. Ignacio’s employer, Santa Barbara City College is an Employer Member of Coastal Housing Partnership. 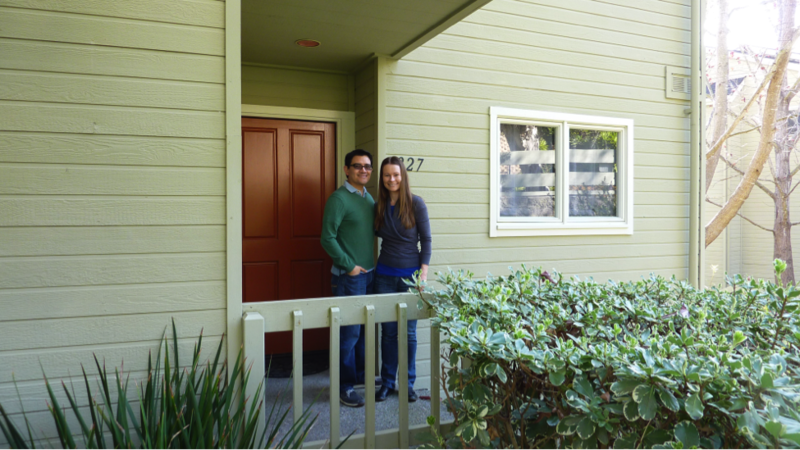 Ever since Ignacio Ponce started working for Santa Barbara City College, he and his partner Katherine Firkins (who works for Cal State Northridge) had the desire to own their own home in Santa Barbara. Despite their desire to own in the city where he works, there was always this thought in the back of their minds: “Will we ever have to move somewhere else where housing is more affordable?” Through Santa Barbara City College (SBCC) coworkers, the couple heard about Coastal Housing Partnership, a nonprofit organization dedicated to serving the community by assisting local employees with their housing needs. SBCC is an Employer Member of Coastal Housing Partnership (CHP); all SBCC employees have free access to their free education, resources and the network of professionals to assist in the home buying process. • A network of service professionals to assist employees in their search for area housing, whether leasing or buying. More than 9,000 employees have attended Coastal Housing home buying seminars in the past fifteen years, and Coastal Housing Partnership has helped more than 10,000 employees become homeowners since its inception. Coastal Housing Partnership Membership is open to Santa Barbara County and Ventura County employers who want to offer their employees a full service housing assistance benefit in a cost-effective way. This entry was posted in Success Stories on October 2, 2014 by Coastal Housing Partnership. 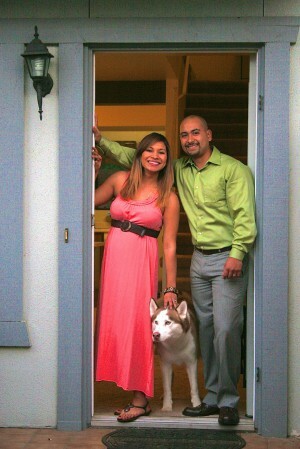 Two years ago, when Cenorina and Ivan first thought of buying a home, all of their offers were rejected. No one could seem to help them work out a deal. Then they found out about Coastal Housing Partnership and how their employee benefit works. The couple attended a Coastal Housing Partnership Home Buying Seminar and then connected with a real estate agent from Coastal Housing’s network services partners. “Education is huge. Without it we wouldn’t have had that extra push… It motivated us!,” the couple shared. Through their employer’s Coastal Housing Partnership housing benefit, Cenorina and Ivan were able to purchase their home with less than a 20 percent down payment. They saved more than $3,000 in closing costs, and are now paying less each month than they would to rent. “We would say to anyone who thinks home ownership is impossible: With knowledge and planning, it’s right around the corner, but we could not have done it ourselves,” Ivan and Cenorina shared. This entry was posted in Success Stories and tagged buying a home, coastal housing partnership, home buying fair, Santa Barbara home buying fair on February 18, 2014 by Coastal Housing Partnership.